This tutorial will show you how to cleave in a certain angle you cannot normally cleave, by switching to normal side views such as shift+2 and shift+3. Once you learn how to do this technique, it can add character to your level, whether it is a canyon wall or an architecture beam. So let's get started. The very first thing you want to do when you're in JED is press F9. The F9 hotkey will load up the Tools window. 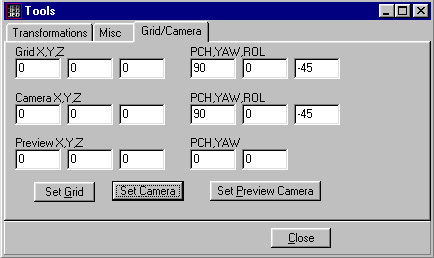 Once you see the Tools window, click on the Grid/Camera tab. Be sure to fill out everything you see in the picture below. I'm going to rotate the sector in a -45 degree angle. You can choose different angles you would want to cleave in by punching in a certain number in your ROL column. Look at the picture below for an example. Once you have those columns filled in, click on Set Camera. This should rotate the sector in a side view in a -45 degree angle. Go ahead and close down the Tools window. But wait! There is no grid. I cannot cleave without a grid! In Jed click on the Command tab and you will see Grid to View. 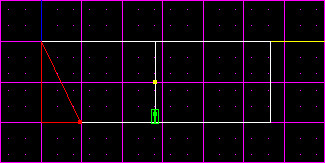 Once you click Grid to View, the grid will appear so that you're able to cleave. For me, I am going to cleave the corner of this sector in a slope. Look at the picture below. As you can see, I want a sloped corner in the sector. 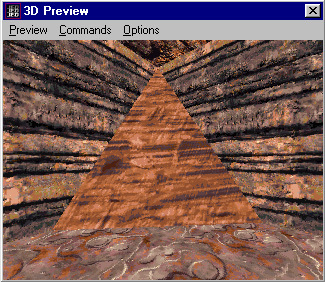 Once I've cleaved and deleted, I'm going to go see what it looks like in 3D Preview. Hopefully you can create a better sloped corner than me with more of a jagged slope. It is a fun technique which not many people do in JED. Happy Cleaving!